The HEXUS editor was at Computex 2018 to see the AMD press conference live, just a fortnight ago. Probably the highlight of the presentation was the announcement of a next gen Threadripper CPU which will come packing 32 cores and deliver 64 threads of processing power. AMD's powerful new 12nm Zen+ Threadripper, configured as four Ryzen dies connected via Infinity Fabric, is destined for release sometime in Q3 this year. It is expected to perform in modern multi-threaded tasks as much as twice as fast as first gen Threadripper processors. You can see some early tests of an air-cooled 32C/64T AMD Ryzen Threadripper CPU from the YouTube video AMD shared of its Computex presentation here (skip to 1hr 15 mins). It swiftly completed a preset Blender render in 29 seconds, while the rival liquid cooled 18C/36T Intel Core i9 system took 39 seconds to finish. Both systems were equipped with 32GB of RAM. 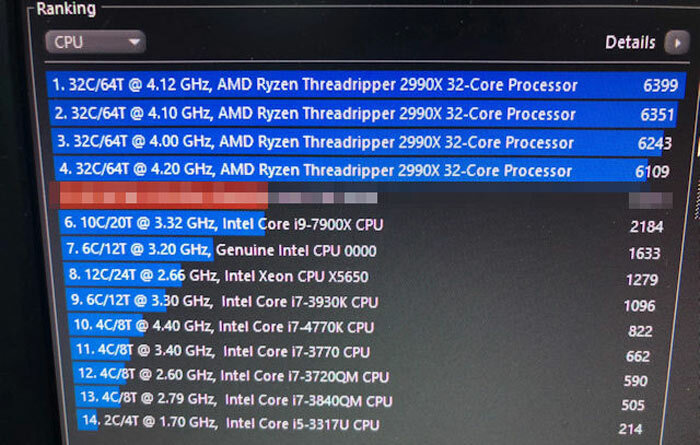 Moving onto the fresh leaks, as revealed by VideoCardz via a Chinese source, first of all we have what is purported to be an AMD Ryzen Threadripper CPU-Z screenshot (above). In the main details tab that is shared you can clearly see that this 32-core processor is based upon 12nm tech, as per the Computex presentation. 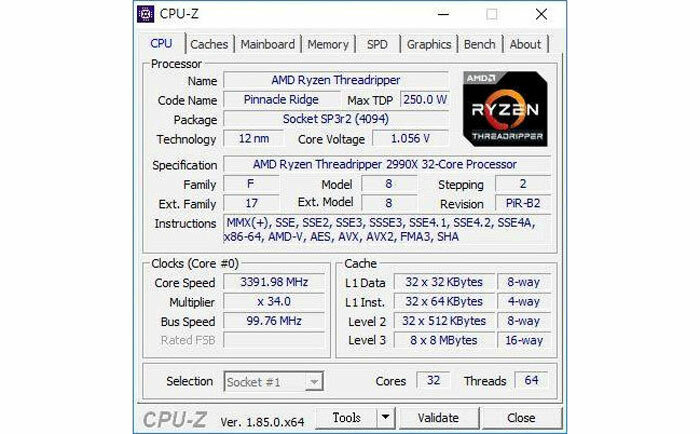 This second gen 32C/64T processor name appears to be 'Ryzen Threadripper 2990X'. We can also see that this Pinnacle Ridge processor has a 250W TDP. Other technical information regarding core voltage, instruction set support, core speeds and multipliers, and caches is shared for you to peruse. Turning to the benchmarks, the 32-core processor was run through multiple Cinebench tests and delivered up to 6399cb. The sample chip seemed to perform best at 4.12GHz which must have provided the best balance between clock speeds and thermal throttling with the given cooling solution. have you priced a Ryzen 7 1700? or 2700 maybe? The 8 core, 16 thread beast might be in reach. Difference this would make to my non-linear analysis and FEM work-flow. High…. At first sight 32 cores @ a 3.4GHz base clock looked very impressive, but then I realised that a 250W TDP is 62.5W per die. Once you take into account the fact that 2 dies have their IMCs disabled and threadripper is meant to get cherry picked silicon, it's actually a bit dull that they're running at 65W Ryzen clocks…. You gotta make the fiscle argument, its not that it will make your job 16 time easier, it will make you 16 times cheeper! And still the manager will think: hey it comes out of my budget and my bonus is based on being under… Damn suits! Maybe these ones are from the same batch as the 65W Ryzen chips, instead of being the cream-of-the-crop the 2-chip Threadrippers are made from?